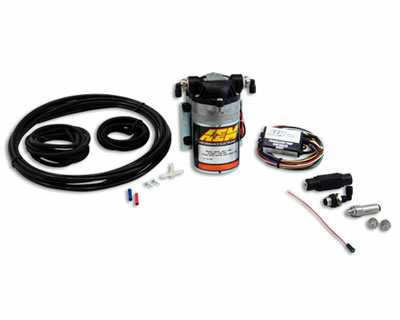 The AEM Water / Methanol Injection Kit is universal by design and adapts to virtually any forced induction gas or diesel engine via multiple jets to suit your vehicle’s power requirements. AEM’s Water / Methanol Injection Kit reduces air inlet temperatures and exhaust-gas temperatures, which allows you to increase boost pressure and advance timing without having to run higher-octane fuel. It’s like getting to run 100+ octane gas for the price of Premium! AEM’s Water / Methanol Injection Kit includes all the features necessary to do water/methanol injection right. No hidden costs or optional components are required. Unlike other popular kits on the market, we include a one- or five-gallon tank with a fluid level sensor standard. Also, because we think engine protection is a requirement, not an option, we include our Boost Safe output in every controller we design. This feature allows you to retard timing or reduce boost via a ground output if the system runs out of fluid or detects an error. With the AEM Water / Methanol Injection Kit, you get all the best features in one low priced kit. Once installed, the Water / Methanol Injection Kit uses a boost-dependent, variable-flow progressive controller to determine the amount of water / methanol mixture (up to 50%) to feed into the inlet stream from the included one- or five-gallon reservoir. The controller commands a progressive 150-PSI pump that delivers the mixture, and flow adjustments at the inlet are made via three included jets designed to match most engine power requirements. The result is significant horsepower gains using pump gas—at about half the cost of Racing Fuel. You don’t have to worry whether AEM has your application because the Water / Methanol Injection Kit is designed to be universal for practically any vehicle. It includes everything you need to adapt it to your steed. Critical safety features are integrated into the system to virtually eliminate any chance of failure, including an integral fluid level sensor in the reservoir, a dash light to warn of low fluid level or error codes (including short circuits, battery voltage and more), and an additional output to either decrease ignition timing or boost if the system detects low fluid levels or a system error.